Figure A69. Pamir anomaly, interpreted as the Pamir slab, with (horizontal) [vertical] cross sections through (A)[D] the UUP07 p-wave) and (B)[D] the combined SL2013 and S40RTS s-wave models at 210 km; C) the location of the modern geological record that we interpret to have formed during the subduction of the slab. Subduction in the Pamir (Figure A69) was first demonstrated by Burtman and Molnar (1993), and became evident from deep seismicity down to 250 km depth (Pegler and Das, 1998; Pavlis and Das, 2000; Koulakov, 2011; Zhang et al., 2011; Schneider et al., 2013; Sippl et al., 2013). 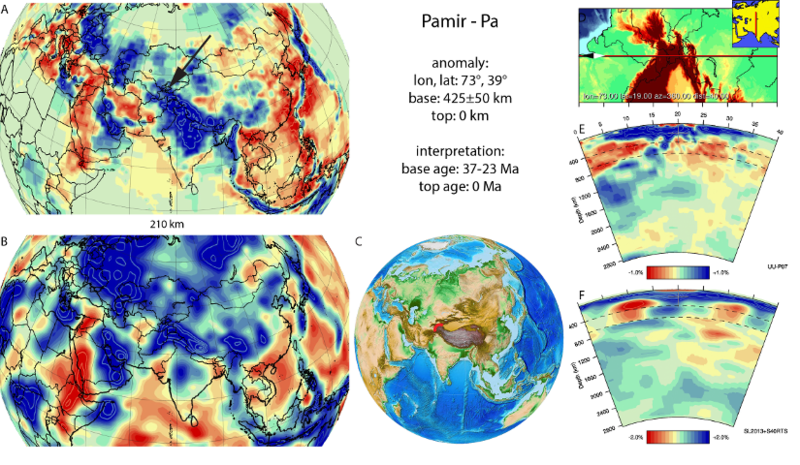 The Pamir anomaly is interpreted to contain Asian lithosphere that subducted southward below the Pamir salient, which is a half-orocline associated with major counterclockwise rotations in the west, and a transform fault in the east – the Kashgar-Yecheng transform system (Bourgeois et al., 1997; Cowgill, 2010; van Hinsbergen et al., 2011a; Sobel et al., 2013). Seismic tomographic images of the Pamir slab reveal that its base reaches down to ~300-400 km depth (Van der Voo et al., 1999b; Negredo et al., 2007) (Figure A69). The nature of the lithosphere of the Pamir slab is difficult to establish. The Pamir subduction zone is not associated with accretion of sediments, but instead with subduction erosion of the overriding plate (Sobel et al., 2013). Because the Pamir subduction zone is currently entirely intracontinental, the Pamir slab is generally interpreted as continental Asian lithosphere, even though it seems to behave in an oceanic manner, dipping near-vertical into the mantle (Sobel et al., 2013). Jackson et al. (2002) suggested that the Pamir slab may have represented a trapped basin of strongly attenuated continental or perhaps oceanic crust similar to the South Caspian Sea. Van Hinsbergen et al. (2011a) kinematically restored the Pamir salient and showed that the ~300-400 km of Pamir subduction is consistent with the northward motion of the northern Pamir relative to the adjacent Tarim basin, i.e. ~370 km based on estimated displacements in the western Kunlun Shan fold-thrust belt and along the Kashgar-Yecheng strike-slip system of Cowgill et al. (2003) and Cowgill (2010). Cowgill (2010) estimated the onset of activity of these structures at 30±7 Ma. Sobel et al. (2013), using thermochronological data from the northern Pamir, estimated an onset of subduction around 25 Ma, at the young end of the spectrum. We conservatively keep the wide age range of Cowgill (2010) to date the base of the Pamir slab.